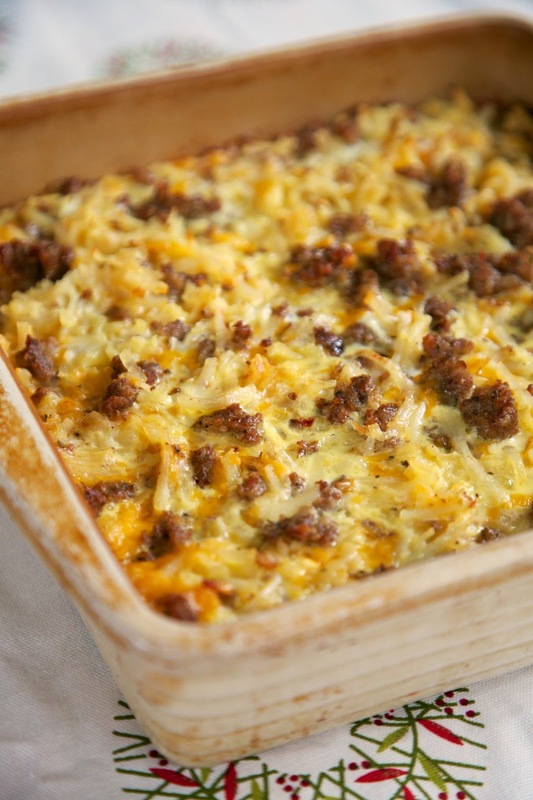 Sausage Hash Brown Breakfast Casserole - hash browns, sausage, eggs & cheese - can be made ahead of time and refrigerated until ready! Great for overnight guest and Christmas morning! This Sausage Hash Brown Breakfast Casserole is perfect for Christmas morning. It can be made ahead of time and refrigerated until you are ready to pop it in the oven. Christmas morning is hectic enough without having to worry about breakfast. Pop this casserole in the oven when you get up and it will be ready after all the presents are open. This casserole has all of my favorite breakfast foods. Frozen hash browns, sausage, eggs and cheese. I browed the hash browns prior to putting them in the casserole. I think it helped get the potatoes fully cooked and crispy. Feel free to skip that step if you wish. Also, I used hot breakfast sausage (Tennessee Pride) in this casserole. I think it adds more flavor, but feel free to use all regular breakfast sausage or half regular and half hot. In a large skillet, cook sausage until no longer pink. Drain fat. Add hash browns to skillet and cook until lightly brown. Place hash browns in bottom of lightly greased 9x13-inch pan. Top with sausage and cheese. Whisk together eggs, salt, pepper, garlic powder, onion powder and milk. Pour over hash brown mixture. Never miss a post! Sign up for our FREE emails and receive posts directly in your Inbox. I love breakfast casseroles and this one looks like a winner, especially since it can be made up early. Yum!!! We are adding this to our Christmas morning breakfast menu. This is in the oven right now. Smells wonderful! Breakfast for dinner. Thank you for all of your delicious recipes. Merry Christmas! I spiced it up by using chorizo and a combo of pepper jack and cheddar. Also added diced green and red bell pepper for texture. Great Easter brunch! Help! I think I messed up! Did you mix the sausage, potatoes, and cheese together?! Mine did not look like the picture (please know I'm a terrible cook). I ended up with a thick layer of potato and then sausage and cheese. Also my egg was runny. I like the idea of the peppers...again are those mixed in or another layer?!?! Please help! I layered the potatoes, then sausage and topped with cheese. If you want to add peppers, you can either cook them a bit with the potatoes or layer them with the sausage and cheese. If your eggs were runny, you need to cook it a few minutes longer. Did you cook the potatoes in the skillet first? That will help the potato layer not be so thick. They will cook down and shrink a bit if you cook them first. Are you supposed to keep covered when baking? I am at 45 minutes of bake time right now and the eggs are still runny. It says to cover and refrigerate if baking later, but the instructions do not say whether to keep covered for baking or not. Thanks!! Is the sausage in the recipe crumbled or cut up before put in casserole? This recipe is wonderful! Very filling and the recipe makes a large amount of food so you can easily feed a large family or guests with the recipe as written. I made a few changes only because of the ingredients I had on hand. The recipe as written is wonderful. I used 2 pounds of a spicy chicken sausage, I did thaw and crisp up the hashbown potatoes before putting in the baking dish, and I added sautéed onions and peppers because I had some in the fridge that needed to be used. I used an extra sharp white cheddar and only one cup of milk because I ran out. It turned out great! I served with salsa and sour cream and had some fresh fruit on the side. Really delicious! This is a go-to recipe for us when we have guests or family over. Thanks so much! I love recipe, but would love to know the nutritional value of a single serving, I cut mine into 12 portions. I travel at Christmas and take food frozen. Can I prepare up to putting it in the oven and thaw and bake later? Even late Christmas Eve, whisking the eggs with one eye open I forgot the milk! This dish worked when I added the milk before popping it in oven today. 40 minutes later I realized that Christmas was not designed for women. This dish will give me the energy to get through the rest of the day. Thank you kindly!!! Will it still taste good even though you didn't cook the hash browns first? It will be fine if you don't cook the hash browns first. Enjoy! Will this reheat well for leftovers?? It's just my husband & I around our house, we would have much than we need for 1 meal. I made this for a large group and everyone loved it. I highly recommend making it the night before and letting the flavors sit in the fridge. It was very flavorful and yummy. Will be making it again soon! Did you have to cook it longer because it was in the fridge the night before? A+ for this recipe! I made this for a work potluck and it turned out SO GOOD!! I added green onions to it for flavor and color. I will defintely make this again. It was so great to put it together the night before and then could quickly throw it in the oven the next morning! Hello, just curious if it would turn out well if I prepare and chill this the night before. I make this same thing except we call it breakfast pizza. I use a pizza stone to mamake it. Comes out delicious and my kids love it. Ok I just got done done making this and it was Amazing! I actually made it the lazy way by just throwing everything in a bowl and baking, I could only imagine how much more Amazing it would be if I had made it as directed. Thank you for an awesome recipe!! Made this for a breakfast meeting at the office!! Turned out FAB. Added sautéed mushrooms green onion red bell pepper, rosemary and a bit of cilantro. Layered..cooked hashbrowns, sausage, veggies, cheese. Poured eggs over dish.. Ended up adding additional 2 eggs. Cooked 370 for 40 min. Amazing!!! Served with sour cream and salsa (if needed). Thank you for a great recipe!! If I cut this dish in half I was wondering if it turn out just as good as the original recipe? I was wondering if this recipe will turn out as good as the original recipe if I cut the recipe in half? I cut everything in half and used a 7x9 pan. Came out super delish! Even though I've made this recipe like at least 7 times at this point and I felt the need to finally comment! This is such a wonderful recipe and easy peezy if you make it one night and bake the next morning for breakfast. I've started making it got all my co-workers birthdays and they love it! My little bit of changes are the following: I use spicy chorizo. Then I sauté green pepper, red pepper, onion, garlic and olive oil. Then I add the potatoes until they have a little crisp. Then I do add seasoned salt to the eggs/milk mix, that is the only thing different I do there. Then level as it says and place in fridge overnight. I truly do feel this makes it better. Made it twice over 1 period of time and just didn't feel it was as good. Then bake in morning and serve with salsa and sour cream. Since you have the spicy chorizo on there it really tastes good with those added condiments really add to the flavor! Love, love, love this recipe and am so glad I found it years ago. I made this last night to bake early this morning so the kids would have a good meal before hitting the road. Made as directed here and, wow, 5 stars! The kitchen smelled wonderful & it got rave reviews all around. I like the chorizo and mix of pepper jack & cheddar cheeses idea and will try that next time. Also needs S&P, that's it, love it! What could i changed the eggs for?We don't eat eggs. Eggbeaters? If you don't eat eggbeaters, you might look for a different breakfast casserole. We have a ham and cheese hash brown Casserole without eggs on the blog. I wanted to make a nice family breakfast, but as many know, I am no kind of morning person. I hate mornings. The only thing I want is a cup of coffee and to be left alone. That's it. However, occasionally, I like to have a nice breakfast with the family, and especially the kids love it when this happens. So I needed something that was quick to fix, and could sit in the fridge overnight, so all I would have to do is pop it in the oven in the morning and let it bake while I have coffee in solitude. So basically I wanted the best of both worlds, and I found it in this lovely casserole. It's simple, delicious, and can be put together the night before, stored in the fridge covered until morning, take it out and let it come to room temperature, about 30 minutes, and then pop it in the oven. Mine cooked for about 50 minutes before it was completely done (probably because it was refrigerated). It came out wonderfully, and everyone loved it. My new fav! Thanks for sharing. This was a huge hit! Great recipe. I actually assembled, cooked & froze it about 3 days prior to serving. Then simply heated it in the oven! Very yummy. Wonder how long it can be refrigerated before baking?? It sounds so delicious!! a day or two would be fine. You can also freeze it and just thaw it out before baking. Enjoy! Can I use fresh hashbrowns from either leftover potatoes or raw? Karen B - I haven't made this with fresh hash browns. I think the cooking time would be different with fresh. I believe that the frozen hash browns are already partially baked before being frozen. Can you refrigerate the night before and then heat in crock pot? How long? I am taking it to school for teachers! although i love the thought of the potatoes and sausage in the recipe,i am trying to cut down on carbs...so i replaced the shredded potatoes with shredded summer squash! Worked out great. I also cooked this in a cupcake pan so i can grab a quick breakfast...and froze a bunch of them to have at a later date! thanks! Very good. I made this for breakfast this morning only cut the recipe in half and used what i had on hand. I used a 8x8 pan, half a chub of Jimmy Dean Sausage, 1 large potato (Grated) 1 cup of extra sharp cheese, 4 eggs and 1 cup of half and half. Used the same spices but half the amount. Thanks for the recipe, hubby is happy, will make again! If I don't cook the hashbrowns ahead of time should I just add them Frozen or thawed? Mom if a 3 year old and 2 month old so just trying to cut down on prep time lol. Thanks! I just throw them in frozen and it always cooks through. Enjoy! 2 lbs of sausage sounds like a lot...has anyone tried it with only 1 lb? I used only 1 pound and it was plenty "sausagey." Also used less cheese because I only had about 12 ounces. I made two layers with hash browns, sausage and cheese then poured in the eggs. How can I go wrong with this recipe as it has everything I love. So easy to make and was so good. I think I will add green onions and serve it sour cream next time, but as is, it was awesome. Thanks for sharing. I am at 55 minutes cooking and the cheese is burnt and crusty. The eggs are still runny! What am I doing wrong? Jamie - I have no idea. I made this for lunch today and it turned out perfectly. My eggs were not runny at all. I made it exactly as written. I made this with only 1 lb. of sausage and used tater tots instead of hash browns, and it was wonderful. In my preheated oven it cooked in exactly 35 min. I made this with 1 pound of sausage and used tater tots instead of hash browns, and it was wonderful. In my pre-heated oven it was perfect in exactly 35 min. I let it sit to rest for about 10 minutes. I will use leftovers to make breakfast burritos. I made this for breakfast today following your recipe. It turned out perfect. Thank you so much for sharing this. It is a keeper. You might want to edit the instructions to say to remove the sausage from the skillet. I added the hash browns to the sausage and then realized later they were supposed to be layered separately. I’m baking it now, hopefully it still turns out!! Thanks for the recipe!! It will be just fine. Enjoy! Could I make this and then freeze it? we are going camping wondering if i could make it Tuesday night freeze it then bake it Sunday morning?? If so do i have to take it out the night before or put it in frozen>> if so then how long to bake it for? Hi! Can this be made in the crockpot? Any suggestions? I’ve made this for the past 4 years in the oven and have loved it! Just needing something I can make and leave. Can you substitute bacon for the sausage? I haven’t made this with bacon, But I’m sure it would be fine. Enjoy! I made this last year for Christmas breakfast. It seemed like too much milk because it turned out really runny. It had great flavor, and Id like to make it again. Any suggestions to make it less runny? More eggs? Less milk? Thanks! Merry Christmas! I've never had an issue with it being runny. Sounds like you need to cook it a little longer. The egg mixture shouldn't be runny if it is cooked. All ovens cook differently, yours might need a little extra time to cook the casserole. I made this for breakfast today! It was so delicious! I cooked the hashbrowns and sausage separately and mixed them together with half the cheese. I only used 1 lb. of sausage and it was plenty. I will add 1/2 tsp onion and garlic powders next time. I brought my eggs and milk to room temperature before cooking this dish, it was absolutely perfect at 40 minutes. I wonder if that's why some people have problems with it being runny. Cold ingredients will take longer to cook. This was delicious and I separated some portions to freeze for when baby comes, thanks for a yummy, easy recipe! 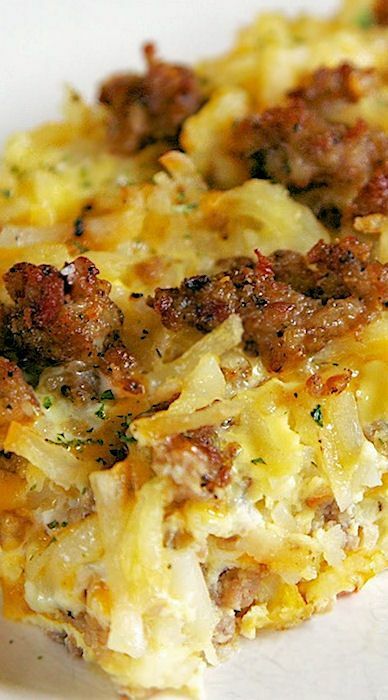 This is the best hash brown casserole ever ! It is my go- to for work potlucks , brunches & Christmas morning . In fact, I’m running to the grocery store soon so I can make it for Christmas morning tomorrow . I’ve made it many times & in different situations . In my experience , if you make it the night before & refrigerate, it takes longer to bake in the next day, maybe 20 minutes? I’ve also had to use “fresh” hash browns from the refrigerated section cause the store was out of frozen. I found the cooking time to be the same. I’ve followed the recipe to the T & have also made it without browning the hash first. Personally, I didn’t think the difference in flavor was too significant, especially if you’re short on time . This is a wonderful recipe that can be tweaked to your liking! Made this today for my "Christmas Morning Casserole." I tweaked it a smidge by adding red and green peppers and onions to the hashbrowns. My family LOOOOOOOOOOVED it...even my picky niece who never tries anything new! The whole pan is nearly gone. Luckily, I managed to save a corner for breakfast tomorrow! Loved this! I made it for Christmas morning and put it together quickly before the kids were awake! My grocery was all out of shredded-style hash browns so I bought the patties that already have a browned crust. I let them thaw enough to be able to slice and dice. One other change, because I did not have garlic powder, was to toss a teaspoon of minced garlic in with the sausage when it was just about done. I layered hash browns, sausage, cheese twice then poured in the egg mixture. I will reduce the added salt next time, but it was REALLY good! Love make ahead breakfast recipes. This sounds perfect. Making it today for New Year's Day breakfast. For those that have cut the recipe in half---how long did it take to cook? I do plan to take it out of frig before putting it in the oven. Wondered if it still took 40 minutes to bake. Thank you. Happy New Year! 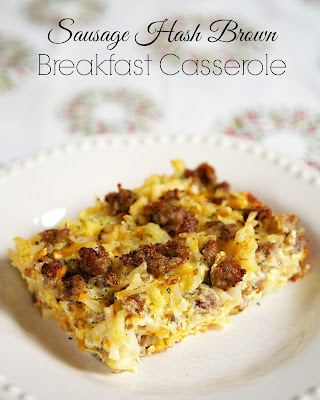 This is so good for breakfast, lunch or dinner and super easy, one of the best breakfast casseroles I have ever had! Made this the other night to have something for busy school mornings!! I modified it a little to my liking, I used turkey sausage, I didn't use quite as many hashbrowns as it called for, and I added spinach and kale. It was HUGE HIT with the whole family, even my 4 year old liked it! I served it with tortillas and salsa... YUM!!! Will absolutely be making this again and again!! I made this dairy free and it was wonderful! A huge hit with all! We also used turkey breakfast sausage... so yummy!! !